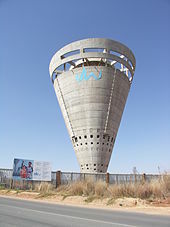 The Johannesburg Water tower, which for many years dominated the Midrand skyline. 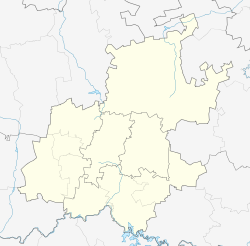 Midrand is an area in central Gauteng Province, South Africa. It is situated between Centurion and Sandton, and is part of the City of Johannesburg Metropolitan Municipality. 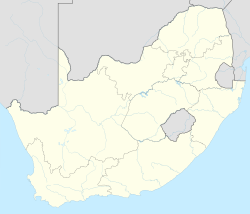 Midrand was established as a municipality in 1981 (in an area known as Halfway House, after its position between Pretoria and Johannesburg), but ceased to be an independent town in the restructuring of local government that followed the end of apartheid in 1994. It was incorporated in the City of Johannesburg Metropolitan Municipality in 2000. It was made part of Region 2 and, as of 2006, when the number of regions were reduced to seven, it forms part of Region A of the City of Johannesburg Metropolitan Municipality. Though no longer an independent town, the name Midrand is still in common use to denote the suburbs around the N1 highway north of the Jukskei River up to the border with City of Tshwane Metropolitan Municipality. (This portion of the N1 highway is also known as the Ben Schoeman Highway.) Suburbs that are generally regarded as being in Midrand include among others: Country View, Carlswald, Crowthorne, Glen Austin, Halfway House, Halfway Gardens, Vorna Valley, Noordwyk, Randjesfontein. In 2010, it was reported that the City of Tshwane Metropolitan Municipality wished to annex Midrand from the City of Johannesburg, reportedly to boost its income, which was severely strained. The city is relatively modern, having experienced much growth in the last|date=February 2017}} decade. Many businesses have relocated there due to its proximity to good highway links and its location in the economic centre of Gauteng Province. Midrand's development has meant there is little break between the outskirts of Johannesburg and those of Pretoria, and the Gauteng Provincial Government envisages that, according to current growth trends, much of the province will be city by 2015. The South African Civil Aviation Authority is headquartered in Midrand, as is the National Credit Regulator. Midrand is also the location of the African Union's Pan-African Parliament and of the NEPAD secretariat. Midrand has the largest conference centre in South Africa which is known as Gallagher Estate which was built on the former site of Laerskool/Primary School Halfway House, which subsequently moved to new grounds near the firestation. The newest landmark of Midrand is the Nizamiye Mosque, the largest mosque in South Africa. The Classical Turkish-style mosque was personally funded by Turkish-born construction tycoon Ali Katircioglu at a cost of R210 million. Midrand is a thriving business node, home to the offices of major corporations such as Vodacom, Microsoft, Neotel, and Altech Autopage. In 2013, Atterbury Properties announced plans to build the Mall of Africa, which would be the continent's largest. The Mall of Africa is located within the green, mixed-use Waterfall City precinct. The N1 Business Park and International Business Gateway are among the prestigious commercial developments in Midrand. The University of South Africa's Graduate School of Business Leadership is located in Midrand. The Midrand Graduate Institute, a Varsity College campus was established in 2012. There are primary and high schools located in several areas. Kyalami, an international renowned racetrack is in Midrand and is the venue for many of South Africa's premier motor racing events. The South African Lipizzaners riding academy is situated in the smallholdings of Kyalami. Midrand is the home of Grand Central Airport and also to one of the stations in the Gautrain rapid rail system. Köppen-Geiger climate classification system classifies its climate as subtropical highland (Cwb). ^ a b c d "Main Place Midrand". Census 2011. ^ "Fight for Midrand". Times LIVE. 3 May 2010. ^ "Contacts Archived 2009-11-27 at the Wayback Machine." South African Civil Aviation Authority. Retrieved on 9 June 2009. ^ Natashia Bearam (17 July 2012). "Constructing a masterpiece". LookLocal.co.za. Retrieved 13 October 2012. ^ "Midrand". Commercial Property in Midrand. ^ "Major Commercial Property Development Underway in Midrand". ANVIL Property Smith. 12 September 2013. Archived from the original on 12 December 2013. ^ a b "Climate: Midrand - Climate graph, Temperature graph, Climate table". Climate-Data.org. Retrieved 2014-01-05. This page was last edited on 25 March 2019, at 16:35 (UTC).